Aqui fica o registo vídeo, efetuado no final da tarde de ontem [dia 7 de agosto de 2016], da agitação marítima no porto do Cais do Pico, situado na vila de São Roque do Pico. 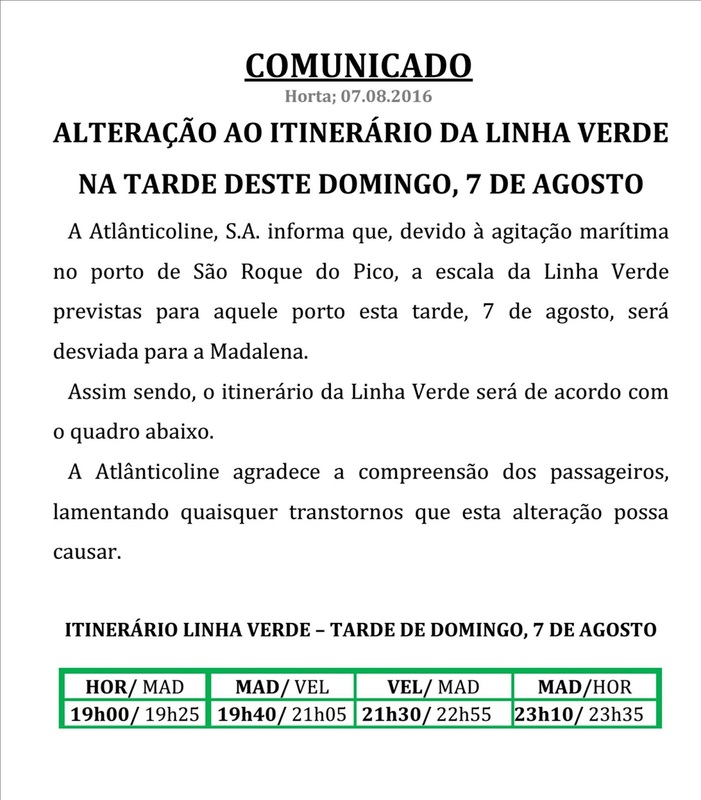 Nota adicional para o facto de as filmagens terem sido feitas à mesma hora que a Linha Verde da Atlânticoline não escalava este porto devido à "agitação marítima" [sic]. (or the staff are liars?) ! In July we booked a day trip from Cais to Velas by car and were telephoned to say that we had to go from much farther Madalena instead. Even the evening return trip was delayed about 2 hours because a Cargo ship was late unloading in Velas. Why are you so sad with everything and everyone? Always complaining about something... if i don´t like azores why do you live there? We should complain in order to improve things but you sound like an old guy/woman dull with life. A única solução é colocar gente capaz e sem bairrismo a orientar estas coisas. Imaginamos o interesse dos decisores, nestas questões do Triangulo. Não me venham com histórias. Querem secundarizar o porto do Cais do Pico. O mesmo se passa com o aeroporto. Nas decisões politicas, se o Secretário não fosse de S. Miguel, nunca teriamos a TAP e a AZORES AIRLINES, no Pico. Alguém duvida. Quem é que fala e defende os bairrismos? Pensem com serenidade e respondam. O tempo dos Distritos acabou...ou ainda não? Because I care a lot about Pico. I bought my house here only about 11 years ago. The reason I came here was because I saw a very special place where I lived in GB gradually turned from something picturesque and historic into something downmarket by ineffective, short-termist, tasteless, short-sighted planning by naive government. It is now largely car parks, is overrun by cheap, noisy tourists and the crime rate has risen steadily. Pico seemed amazingly unspoilt, undeveloped and stable so I retired here. But now I see the same very rapidly happening to Pico and it's charm being destroyed and it is heartbraking. The arrogant glass and cement terminal in Madalena is a prime example. Madalena had the potential to become a picturesque small harbour with marina with a fantastic atmosphere for local people and for quality tourism. 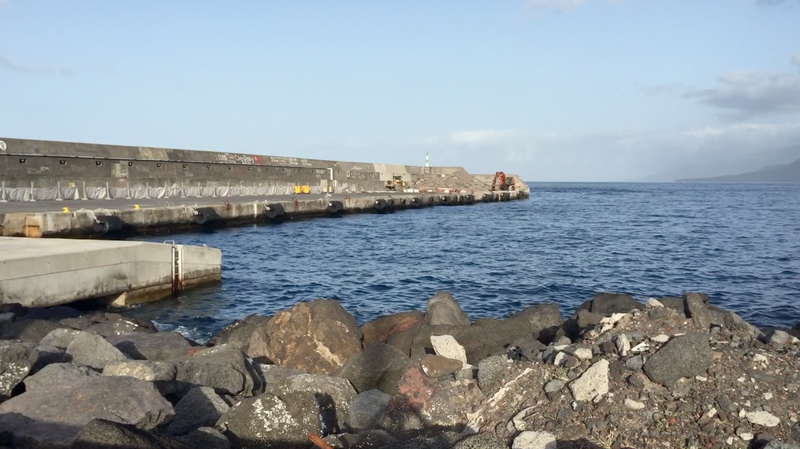 Instead they have destroyed a world class view of the Two Brothers and Faial in the background with a horrendously badly planned, over-sized, banal cement airport/bus terminal that you can find in any dusty, boring, downmarket suburb around the world. The view of the working harbour is now blocked. The whole reason why people come to an island is to experience a marine setting, not sit and stare at a stupid glass infrastructure building (most people don't even like air travel, which is how they now try to operate the new ferries, complete with robotic wishes of a "nice journey") People wouldn't know that behind the terminal they could probably watch huge Tuna being unloaded from the fishing boats, a shoal of fish being chased by a Bicuda, or old Joao going out in his small, beautifully painted fishing boat, waving to his even older friend fishing for Sargos from the pier. I have barely scratched the surface of what is going wrong (and just how horrendously bad the terminal is) but those who don't get what I am talking about, never will. I have too much here to up roots again, Peter, so I am staying and fighting for Pico's charm, because most won't. 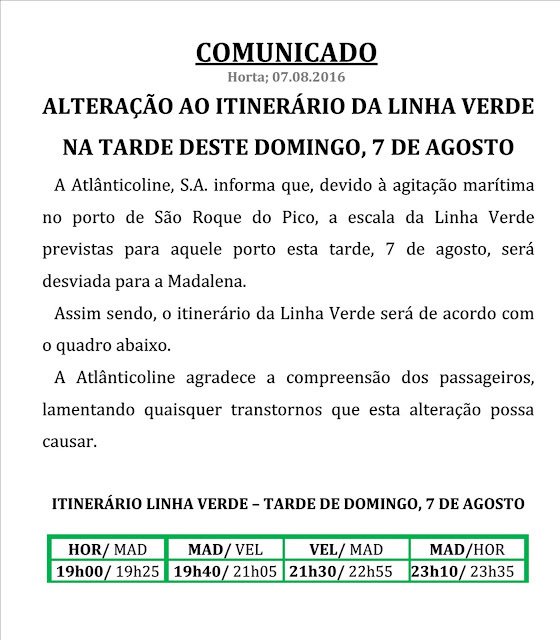 ... and coming back on topic, I doubt the real Mestre Simao or even the original staff of the old Cruzeiros would have lied about the reason for a service not happening, because they respected their passengers! Ok, now I see... and maybe i´ll join the fight when I move to the Azores! Thanks.